For more than six years now, Bebé Due has been collaborating with the Sant Joan de Déu Hospital, which is considered to be at the forefront of mother-baby care. As part of this collaboration, Bebé Due funds two parallel studies related to premature babies. The first one studies the mechanisms of foetal and perinatal growth, taking epigenetic factors into account. 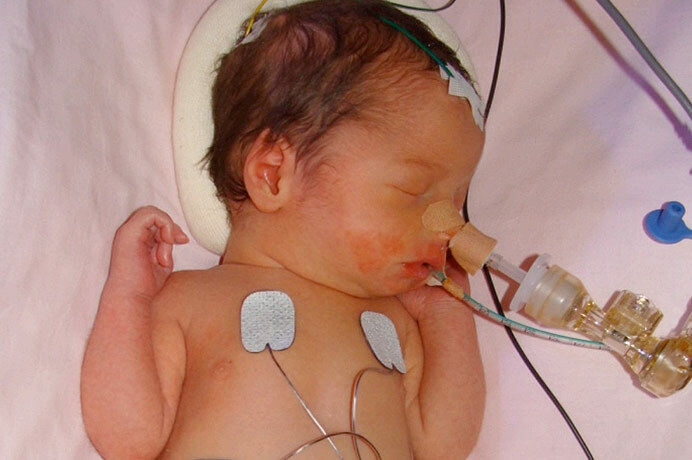 The second researches the possible impacts - on the adult lives of premature babies - of being born premature with low birth weight (75% of the babies admitted) or with congenital malformations, respiratory problems or infections (25 %). The hospital has more than 130 years of experience, and specialises in the problems of women, children and adolescents. It combines the human side of healthcare with scientific progress. The studies funded by Bebé Due have as their starting point adverse perinatal conditions and focus on neurodevelopment. The importance of these studies lies in the fact that it is in the prenatal period when an unborn child experiences its fastest growth, and when the most important organs - which will influence the sort of life the baby will have as an adult - are formed. Some of the most significant results obtained in the course of these years have shown that heat, breastfeeding, breathing support and the skin-to-skin technique improve quality of life for these babies. The Sant Joan de Déu Hospital chose the Bebé Due maternity sling three years ago, for skin-to-skin therapy, and it has now been demonstrated that this sling has contributed to the recovery of babies born preterm. Bebé Due supports the Doctors Without Borders' campaign to prevent transmission of HIV from mother to child. Bebé Due supports the book " A hospital in Africa "
Scream for someone else's pain!